Wolves There are dozens of subspecies of Canis lupus including the dingo and our friend, Canis lupus familiaris. The remaining subspecies are varieties of wolves. There are only a few thousand grey wolves estimated to be in the lower 48 United States. The Wildlife Conservation Society estimates there to be about 7,000 in Alaska and 50,000 in Canada. We will expand this section to discuss wolves outside of North America in coming months. In a highly controversial move, in 2011, President Obama lifted endangered species protection on Gray wolves, which has led to a hunting frenzy and once again, has put this iconic species in serious peril. 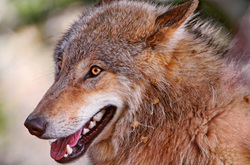 Wolf Conservation Center Founded in 1999 by French pianist Hélène Grimaud, WCC is located in South Salem, New York. Wow, looks like a dog! Dogs and bears both belong to the order Carnivora, making them not so distant cousins, but bears are most closely related to seals. 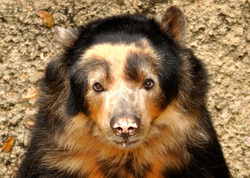 The Andean Bear, also known as the spectacled bear, is native to South America and just a few thousand are believed to remain in the wild - high in the Andes mountain range. They are no longer found in the lowlands, because that territory has long been converted for agricultural use. With the warm climate, these bears do not hibernate and they have thin fur. Primarily vegetarians who eat cacti among other vegetation, they get into trouble when they attempt to eat domesticated animals and are shot down by farmers. Human growth has caused fragmented bear populations and inbreeding has a negative impact on genetic viability. Another threat is that bears are hunted for meat, skins and fur. ﻿Spectacled Bear Conservation Peru﻿ Based in British Columbia, this Canadian organization works in the dry forest habitat of Norther Peru. Asiatic Black Bear by Art G.
These are some of the toughest countries in the world to be a bear because of the nefarious bear bile industry. Unfortunately bear bile is a valuable commodity for sale as an ingredient in traditional Chinese medicine. 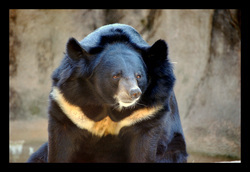 The Asiatic Black Bear is the most common victim, but Sun Bears (below) are also used. During the extraction process, these bears are kept in "crush cages" that are no bigger than their bodies. Cubs are routinely taken from the wild to stock bear farms. Bears who are enslaved for their bile usually live about 5 years, whereas unmolested in the wild they could live for 30 years. Clearly this practice results in severe stress on the bears and there have even been reports of bears killing themselves. The product with bear bile as an ingredient is used to treat hemorrhoids, sore throats and hangovers, among other things. The efficacy is highly controversial, with some scientists suggesting that the product is nothing more than a placebo. There are many herbal alternatives that eliminate the need for this barbaric practice. Asiatic black bears have a characteristic crescent shape on their chests and they are also known as "Moon Bears of Tibet." It is difficult to estimate how many are left in the wild, but these bears are under extreme threat. Bears are also killed for Bear Paw Soup, which is considered a delicacy in some Asian countries, where some believe that eating the soup will give them the strength of a bear. In addition to being used for so-called medicine and food, Asiatic Black Bears are subject to the same threats as all endangered bears, most notably habitat loss. Animals Asia Founded by British veterinarian Jill Robinson in 1998, Animals Asia works to end bear bile farming. Free the Bears Australian-based organization founded by grassroots activist Mary Hutton in 1993. Sun bears are extremely rare and are distinguished by a golden U-shaped patch of fur on their chests and their small stature compared to other bears. They are also known as the honey bear because of their love for honey, which they are able to extract from hives with their long, narrow tongue. Sun bears are victims of habitat loss and hunting for bile, meat and fur. See Animals Asia and Free the Bears above. Once common throughout North America, there are now very few brown bears left in the lower 48 states, with most surviving populations in Alaska and Canada. These bears can also be found in Russia and there are a few scattered populations in Europe and Asia. Varying in size and color, these bears have a distinctive "hump" between their shoulders which is a muscle that gives them enormous strength. Subspecies include the Kodiak Bear or Alaskan Grizzly Bear. Though numbers have diminished drastically in the past 200 years, there are thought to be over 200,000 of these bears left in the wild. Those in Asia are subject to the same threats of being killed for medicine or soup. The Himalayan brown bear is critically endangered because of poaching. Some subspecies are extinct or near extinct. There used to be a Mexican grizzly bear, which is now presumed extinct. Once common throughout China, Burma and Vietnam, approximately 2,000 are thought to remain in the wild. Pandas are the victims of extreme habitat loss and poaching for fur. There are dozens of reserves in China and pandas are bred in captivity, which is controversial among conservationists because of the enormous amount of money that has been spent and the fact remains that Panda habitat is virtually decimated. Pandas do not hibernate and are known for their love of bamboo, which is not dense with nutrients, so they compensate by eating nearly 50 pounds of bamboo a day. ﻿Pandas International﻿ Colorado-based PI was started by Suzanne Braden and Diane Rees in 1999. Polar Bear Arctic regions of: Canada, Denmark, Norway, Russia and the U.S.
Polar bears are the largest carnivores on earth and at the same time, they are considered to be marine mammals, who can swim many miles without rest. With front paws that are partially webbed, a thick layer of blubber and oily skin and fur that repels water, they are built for the water and for killing seals, their primary food source. For decades large scale hunting decimated populations and hunting is still a problem, but there was a rebound after controls on the hunting went into effect. In some areas hunting practices are highly controversial and may be unsustainable, such as in parts of Canada where traditional subsistence hunting by indigenous peoples now competes with sport huntering because quotas are in effect. While most of the quota is hunted by the Inuit people, a growing share is sold to recreational hunters. It is no surprise that climate change is the Polar bear's biggest overall threat however, with more and more bears drowning as ice packs melt at unprecedented rates. Pollution and the negative impacts of oil and gas drilling are also threats to this species. The outlook for Polar bears is fairly bleak. The U.S. Geological Survey predicts that two-thirds of the world's polar bears will disappear by 2050. The Sloth bear is native to India and is found in Bangladesh, Bhutan, India and Nepal. 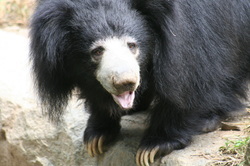 The other subspecies of Sloth bear is the Sri Lankan Sloth bear, which is found only on Sri Lanka. With front legs that are longer than hind legs, front paws that are turned inwards and that have long, curved claws, Sloth bears are built for digging for ants and termites. They face habitat destruction, hunting and being captured and enslaved as performing animals. While endangered, the Sloth bear may be better off than some, with numbers estimated at over 10,000 in the wild. Wildlife SOS India This New Delhi organization was established in 1995.